Since the end of World War II there have been 35 floor votes in the Senate to confirm or reject Supreme Court nominees. Unsurprisingly, the outcome of the 35 votes reveals a striking decline in the Senate’s collegiality. A C score greater than 1 implies some degree of (net) support from the opposing party. The higher the C score, the greater the degree of support from the opposing party. Tom Clark, nominated by Democrat Harry Truman, was confirmed on August 18, 1949, by a vote of 73-8; that is, he received 90 percent of the votes cast. Democrats then held a 54-42 majority in the Senate, just over 56 percent of the Senate’s 96 seats. Dividing Clark’s share of the vote by the Democrats’ share of Senate seats yields C = 1.60. Clark, in other words, received 1.6 times the number of votes controlled by the party of the nominating president. Samuel Alito, nominated by Republican George W. Bush, was confirmed on January 31, 2006, by a vote of 58-42; that is, he received 58 percent of the votes cast. Republicans then held 55 percent of the Senate’s 100 seats. The C score for Alito’s nomination is 1.05 (0.58/0.55). Nine nominees were approved by acclamation, that is, by a unanimous voice vote. In such cases, the value of the numerator in C is 1. But C varies, even in cases of acclamation, because of variations in the fraction of seats held by the party of the nominating president. In any event, the last confirmation by acclamation was in 1965 — an ill omen for collegiality. Three nominations were rejected in an “up or down” vote. (Several others failed, by withdrawal or lack of cloture, before reaching a final vote.) Two of the rejections were of Nixon nominees: Clement Haynsworth (1969) and G. Harold Carswell (1970). One was a Reagan nominee: Robert Bork (1987). Because the GOP held such a small fraction of Senate seats in 1969 and 1970, the C values for Haynsworth and Carswell actually exceed 1. But Bork was so roundly defeated that the C value for his nomination is less than 1 — the only such case. Kavanaugh’s nomination came close, at 1.004 — the lowest C value for a confirmation in the past 73 years. C peaked in 1975 with the confirmation of John Paul Stevens, a nominee of Republican Gerald Ford. (One of many disastrous nominations by GOP presidents.) It has gone downhill since then. 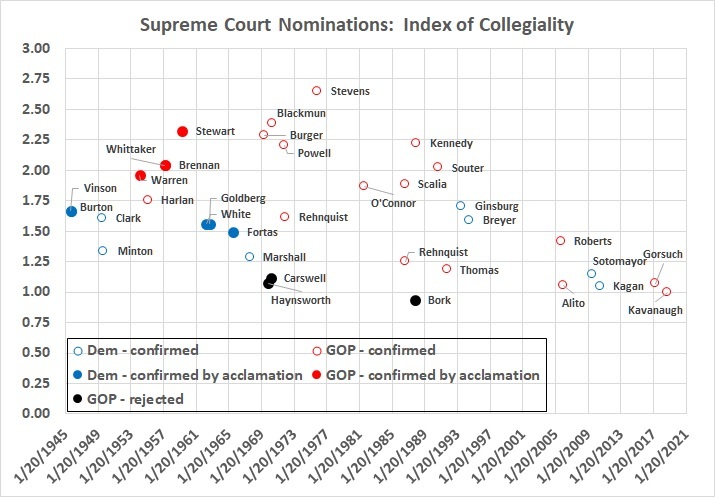 The treatment of Brett Kavanaugh caps four decades of generally declining collegiality. The decline began in Reagan’s presidency, and gained momentum in the presidency of Bush Sr. Clinton’s nominees fared about as well (or badly) as those of his two predecessors. But new lows (for successful nominations) were reached during the presidencies of Bush Jr., Obama, and Trump. None of this is surprising given the deterioration of political discourse over the past several decades — and especially given the demonization of Republicans by Democrats and their allies in the media. What is surprising — gratifying, really — is that Republicans seem to be waking up to the fact that playing Mr. Nice Person will not win them any points with Democrats, the media, or their base. The only way to win, in the present and foreseeable political climate, is to fight hard, and fight to the bitter (or sweet) end. This entry was posted in Constitution - Courts - Law - Justice, Politics - Politicians - Government in Action and tagged Supreme Court nominations. Bookmark the permalink. ← No More SCOTUS “Swing Vote”? Good!